Dialectical Behavior Therapy (DBT) is a compassionate type of behavioral therapy that is intended to help people move towards having a life that feels more meaningful and worth living. It is an evidence based treatment that has proved effective for anxiety disorders, mood disorders, personality disorders, addictive disorders and impulse control disorders. By combining standard cognitive-behavioral techniques for emotion regulation with the concepts of distress tolerance, acceptance and mindfulness, the skills taught by DBT strengthen a person’s ability to handle their emotions without losing control or engaging in destructive behavior. Combining several therapeutic approaches, DBT was originally designed for severe mental illness (people engaging in self harm or with chronic suicidal thoughts). Research is finding that DBT can be extremely effective in less severe areas, such as anxiety, mild depression, relationship conflict – in essence: wherever there is a need to regulate emotions. Once learned, these skills can be applied in our everyday lives, including stress related to work, family relationships, and medical conditions. DBT was designed by Marsha Linehan, Ph.D., beginning in the 1970s. Dr. Linehan pulled from effective treatments such as cognitive behavioral therapy, assertiveness training, validation strategies, and Buddhist mindfulness meditations. Dr. Linehan then went on to study DBT in clinical trials, showing that DBT is, in fact, extremely effective in the treatment of patients with chronic suicidal thoughts. Other clinicians have furthered her research into other areas. When most people think of therapy, they think of interpersonal therapy, where you talk about your feelings and your past. While DBT employs much of the change process involved in standard Cognitive Behavior Therapy (CBT), the use of validation/acceptance is added. DBT, like most behavioral therapies, meets you where you are in the current moment; focusing on helping you change ineffective ways of coping by learning new, skillful ways to deal with situations. By validating the client, the therapist is able to reinforce the dialectic: the idea that seemingly opposites can coexist and be synthesized. This means weighing out various points of view in any situation by constantly balancing the ideals of acceptance and change, and assists in creating a life worth living for the client By the teaching of skills, DBT relies on specific goals that can realistically be attained. At times DBT is referred to as a "doing" therapy rather than a “talking” therapy. While DBT does ultimately focus on past experiences the first six months to year of treatment are spent ensuring the client is effective in their current daily life. Diary cards are kept to maintain progress and obtain an overview of the client’s week. Additionally, therapists are available for “coaching calls” between sessions so skills can be reinforced in the moment. 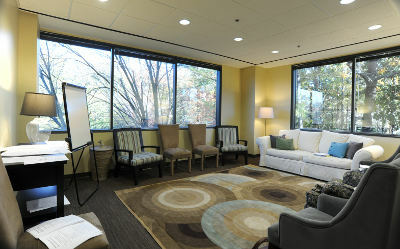 Finally, all Peachtree DBT therapists are required to participate in a weekly treatment team to assist one another in providing effective and compassionate treatment for all clients. We recommend the "What is DBT?" page on Behavioral Tech's website for further reading into the development of and research into Dialectical Behavior Therapy. Behavioral Tech was founded by and collaborates with Dr. Linehan.